is the definitive book on the subject for anyone aboard a yacht of any size. It is aimed at the yachtsman or seafarer who is likely to proceed to sea out of the sight of land, whether for pleasure or professional reasons. Fully compliant with the IMO (International Maritime Organisation) resolutions and MCA (Maritime Coastguard Agency) regulations it embodies Sea Safety checks issued by the MCA and RNLI and is completely international in its appeal. Includes chapters on safety and survival equipment, Global Maritime Distress and Safety Systems (GMDSS), liferafts, grab bags, medical equipment and advice, first aid and emergency treatment, abandoning ship, survival in a liferaft and rescues at sea. This is the first modern book to tackle the subject from the small craft point of view. The purpose of this text is to ensure the survival of skipper and crew in the event of their boat sinking. 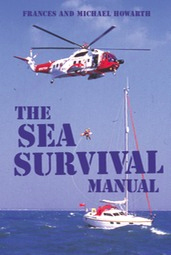 It features: advice on the essentials to pack into the emergency grab bag for a short or long cruise, hot or cold climate, coastal or offshore trip; flowcharts to prioritise abandon ship procedure; techniques for survival in the liferaft, short- and long-term – the why, when and how of liferaft survival; and checklists and tables. A Guide for Watchkeepers of Large Yachts Under Sail and Power (Reed’s Professional) This is the essential manual for every yacht captain and all those aspiring to become one. It outlines the correct protocol for keeping watch to STCW-95 standards and the procedures to be followed on the bridge of every yacht irrespective of the vessel’s flag state or the ensign flying at her stern. It caters specifically to the needs and requirements of large yachts and the professional crews that man them. 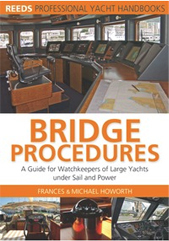 Packed with essential information and useful checklists it covers: Bridge organisation Duties of an OOW Principles of operation and maintenance of equipment including radar, chart plotters, compasses, echo sounders and AIS equipment The watchkeeping elements of all yacht training school courses, following the syllabuses laid down by the RYA, International Yachtmaster Training and the MCA. This book is fully compliant with ISM procedures stipulated by the IMO and is written to conform to the MCA’s Large Yacht Code, as well as yacht codes issued by other authorities. The Reeds Professional Yacht Logbook is customised specifically for the large yacht market to aid the requirement by law to keep a log both on passage and in port. It is recommended and approved by the Maritime Coastguard Agency and covers a three month period. The log is divided into two sections: ‘on passage’ which includes status and navigation sheets; and ‘in harbour’ which includes watchkeeper’s and daily report sheets. Also included are logs for tests, drills and inspections aboard, crew lists, load lines and helicopter operations. It will be welcomed by skippers and crew of large yachts, for whom there is currently no suitable logbook to fulfil their particular needs. This is the first modern book to tackle the subject from the small craft point of view.